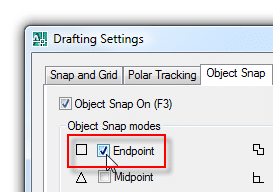 Object Snaps (OSNAP) are among the most fundamental AutoCAD topics I know. 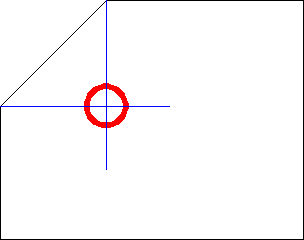 Without them, drawing two intersecting lines can be described as arbitrary at best. A lesser known OSNAP function is this thing called Object Snap Tracking. Simply put, Object Snap Tracking can reduce if not eliminate the number of construction lines you draw, just to erase moments later. 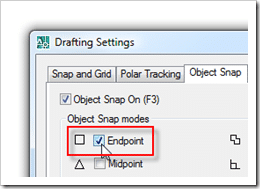 To use Object Snap Tracking you must first have both your Object Snaps (OSNAP), and your Object Tracking (OTRACK) turned on. Even though the 2 blue lines didn’t take me all that long to draw, since they are just going to be erased in a matter of minutes – it’s time wasted. Object Snap Tracking let’s you “draw” disposable lines on the fly. Running OSNAP’s – Before starting, I am going to make sure I have my “Endpoint” OSNAP on. Doing this will let me lock into the endpoints of my diagonal line. The OSNAP’s you use will be dictated based on what you’re trying to draw. Hover over the first OSNAP point until after you hover away a little yellow cross appears. Repeat on your second point, hovering until the yellow cross appears. Two tracking lines will now appear, and I can click at their intersection to draw a CIRCLE from that point. If you’re like the majority of the individuals I have taught this feature to; chances are – it won’t work the first time you try it. It will indeed take some practice, but once you get the hang of it…. watch out!!! Thanks for sharing this tip. OTRACK is new for me and will be GREAT! 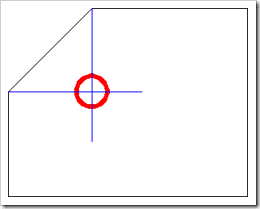 I just moved up to AutoCAD2008 from 2005LT and for some reason my dimensions won't snap and therefore don't align exactly with the other dimension — how do I fix this? I always wondered what tracking was used for, thanks.